The following applet illustrates what it means for two angles to be classified as congruent angles. Interact with this applet for a few minutes, then answer the questions that follow. Be sure to move the BIG PINK POINTS around each time before you re-slide the slider. 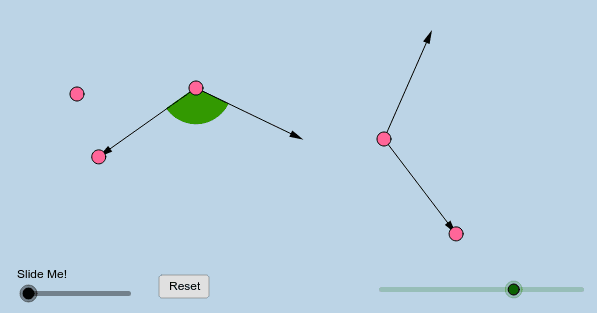 1.4 A) What types of geometric transformation(s) took place in the applet above? List it/them. B) Did any of these transformations change the measure of the original green angle? C) Use an "if and only if" statement to define what it means for angles to be congruent. D) If we know that two angles are congruent, what can we consequently conclude about their measures?